Test your intellect against eight amazing pioneers of modern science! Great Minds brings together our favourite puzzles of all time and links each with one of the greatest minds in history. The set of 8 brings together the Napoleon, Cassini, Drake, Jefferson, Khufu,Telsa, Van Gogh and Mozart puzzles, to create the ultimate set for the puzzle lover! 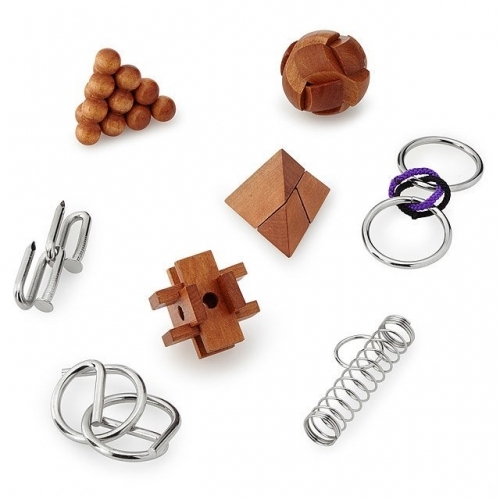 Makes a perfect for gift for those who enjoy a mental challenge. 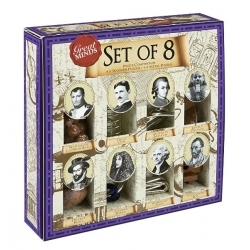 The eight puzzle set includes napoleon's cannon balls, cassini's rings, drake's bowl, jefferson's nails, khufu's pyramid, telsa's coil, van gogh's box and mozart's bass cleff puzzles.